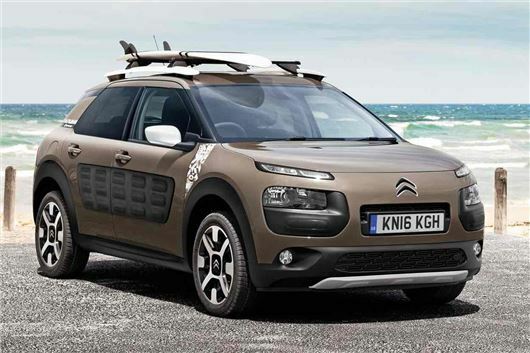 The C4 Cactus you see here is the £18,480 result of a tie up between Citroen and eminent maker of jazzy surf shorts Rip Curl. The Cactus Rip Curl Special Edition is available to buy from 1 June. However, more than being limited to a few stickers and a paint scheme, the Rip Curl edition marks the first time a C4 Cactus has been endowed with Citroen’s Grip Control system. The car remains front-wheel drive, but now has adjustable traction control that, in Citroen's words, “allows drivers to select different modes to deal with the types of surfaces encountered as part of an adventurous outdoor lifestyle, such as snow, mud and sand.” To that end the 17-inch alloy wheels come wrapped in Goodyear ‘mud+snow’ tyres. Two engines are available, the PureTech 110PS turbo petrol unit and the 100PS BlueHDI diesel – both engines from the upper echelons of the Cactus range, with a base level PureTech 110 model, for example, priced at £16,455. Aside from the traction control system there are, of course, visual changes marking out the Rip Curl version, including exterior graphics, white mirrors and roof rails, orange seatbelts and some orange interior trim. A panoramic sunroof is standard, as are rear parking sensors, a rear view camera, air conditioning, automatic lights and wipers, navigation and cruise control. You can have it in five colours, each with a fancy name but which basically boil down to black, red, white, grey and brown.